You can purchase Reclamation here. Dana Perry’s last recording, Me & Lady G (read the review here), might be considered her proper debut. Her first two EPs were self-produced but for that one Perry stepped into Beth Kille’s Studio Gusto Gold, employing her as co-producer along the way. Basically a guitar-and-voice recording, the instruments were crystal clear and resonant, the vocals pure and up front. For Reclamation, Perry went back to her do-it-yourself approach while stretching out by presenting her deeply meditative songwriting in a band context. She recorded and produced the material under her own Folk U Productions banner, using what space was available like living rooms, bedrooms and basements. 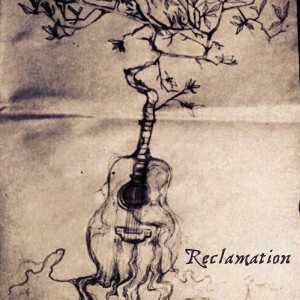 Reclamation is five new songs and two re-recordings of older songs. Immediately noticeable is Perry’s more refined use of lyrical space. Her prose is less cluttered, less Ani DiFranco ramble. Perry seems to be finding her individual voice, sculpting the melody to flow with the song rather than stuffing in too many syllables. Like most artists, that self-discovery is achieved through some measure of tribulation and Perry recounts her experiences with loss and alienation convincingly. Also noticeable are the drumming performances from Jenna Joanis. She’s developed a remarkable flair on the trap set and is able to slip into the feel of the songs with ease. Little embellishments on the hi-hat, for instance, are expertly placed, resetting the listener’s attention level. Joanis also contributes the bass parts, David Bryan adds clarinet and harmonies. The album kicks off with a tune that She She has been playing for some time, “Textbook Delusional.” For about two minutes things don’t stray too far from the expected. Then the chorus kicks in. It’s a little bit like going from CSN to Déjà Vu, a powerful statement of nonconformity that is bolstered by monstrous bass and layered guitars. The five new songs that follow exemplify the strides she’s taken in her songwriting. The passionately delivered “Everything is Moving” is a banner waver complete with a verse paying homage to Madison. “Dark Matter” has a cool groove and the breathy vocal approach is something different for Perry and quite effective. “Back to Home” is another cool song and here the electric guitar figure sounds just right. The transition to the chorus is nifty adding a half-measure that stirs up the arrangement. A nice melody and sentiment. In the end, one can’t help but feel that the choice to go it alone in terms of the production came down to the inability to finance recording studio time. A time-honored tale in the lives of developing musicians everywhere and a problem that crowdfunding has very successfully addressed. Reclamation is a step down sonically, with a crowded lower end and less breathing space in the mix. The rich acoustic guitar tone from Lady G is largely missing, the lead guitar lacks tone, is relegated to the background and her ability as an electric guitarist doesn’t rise to the level of her acoustic playing. Many artists would call the process Perry has done a reference tape; a model of how they feel the recorded parts should stack up, which is then taken to a pro studio and recreated with the help of an engineer who can more fully realize the potential of the material. There are those who are perfectly happy with a lower fidelity approach but rarely is an artist able to move up any ladder of success with that approach. Some artists are also perfectly happy hanging out on the lower rungs but for a musician like Perry, who appears to aspire to bigger things, trajectory is critical – very difficult to maintain and even harder to recover. The songs and delivery are a different story and Perry’s commitment to her craft is obvious; you can feel her reaching up. For a critical listener then, Reclamation is about what it could (and should) have sounded like; a pretty good result for what should have been much greater.